This time of year, deciduous trees go dormant, and evergreen trees such as pine are more visible in the landscape. Pine trees, like other plants, can suffer from attack by pests, whether on your property or in our forested areas in California. Pine trees do best when planted in well-drained soil in full sun, and most species need little water once established. Trees can ward off attacks by many insects and diseases if taken care of properly. 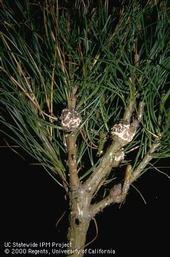 Several diseases can affect pine trees, such as rusts, blight, and root rot. Disease symptoms vary, but may include discoloration of leaves or needles, cankers, galls, and ooze. Is your irrigation system set to water deeply and infrequently? Do you regularly check and adjust sprinkler heads? When you mow, do you remove less than 1/3 of the leaf blade? Do you grasscycle to add nutrients back into your lawn? 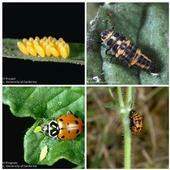 Lady beetle life cycle (clockwise) eggs, larva, pupa, adult. You're probably familiar with lady beetles (aka lady bugs), common beneficial insect predators that prey on aphids and other soft-bodied insects. However, lady beetles are not the only beneficial predators that can be found in your garden and landscape. Other “natural enemies” such as assassin bugs, minute pirate bugs, lacewings, predatory wasps, spiders, and predaceous ground beetles attack and kill pests. In some cases, both the adults and larvae are predators. It's important to recognize the different life stages of these beneficial predators so you know they are helping control pests and not attacking your plants. If you are seeing black and red bugs scurrying about near trees and buildings, they may be boxelder bugs. Boxelder bugs (Boisea rubrolineata) feed on the flowers, leaves and seedpods of female boxelder trees (Acer negundo) and occasionally are found on maple and ash, and sometimes on certain stone fruits and grapes. Boxelder bugs are often confused with other insects that look similar such as red-shouldered bugs, squash bugs, the bordered plant bug, and leaffooted bugs. This insect doesn't usually cause significant damage to landscape plants, but when their numbers are high during fall, they can build up on outside walls or sometimes enter houses and may be considered a nuisance.